Eight days into the trip and our course is much better. So far the weather at this time of year is perfect. Winged-out sails helping us on a direct course to Azores, still keeping between 32-35N to avoid any blows from the west. GRIB files less detail now as we use our Iridium 9555 Satphone and Optimizer to download. Day seven: Friday 26th May. 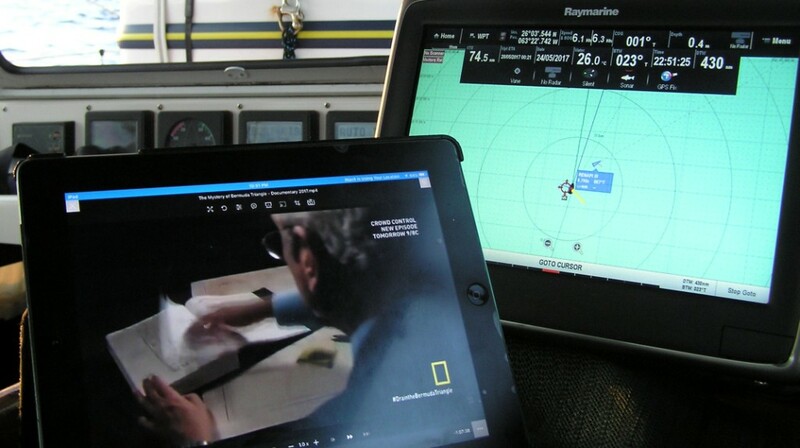 Keeping an eye on the course and horizon, while watching documentaries and movies on iPad. To the north of us a low pressure system is blowing in from the west. As the wind is sucked into the centre of the system which rotates anti-clockwise, southerly winds develop in our region then develop into westerly winds. 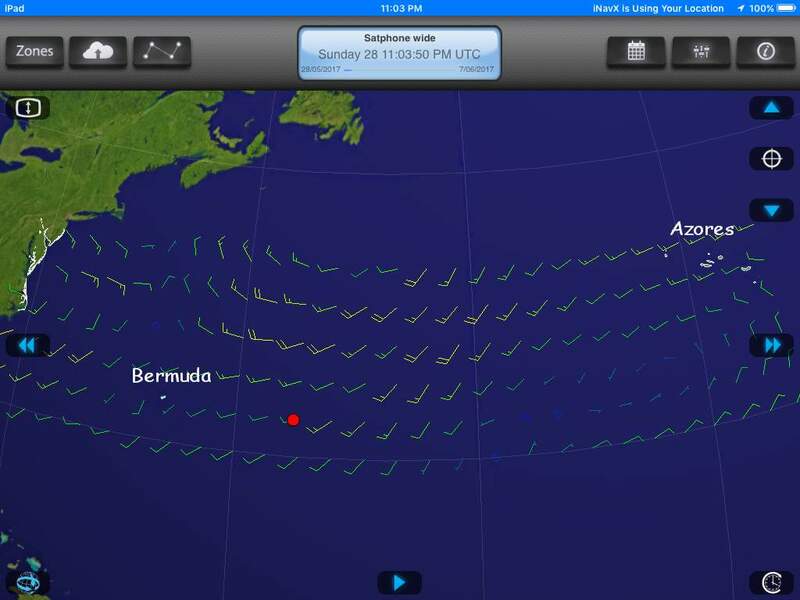 Our goal is to reach this stronger westerly wind to catch a ride east. There’s quite a bit of planning that goes along with sailing! For most of the day we sailed steadily making good northeast progress until the wind died later in the afternoon. So to keep up the momentum to reach the south-westerly winds of the passing low, we turned on the iron sail for few hours until we had 12-14kn of southerly breeze to help us sail. Already one week at sea with maybe two weeks to go. I’m already into my second novel (David Baldacci’s ‘The Last Mile’) and plan to devour a few more by the end of this trip. We’ve settled into our offshore routine of cooking, eating, sleeping, sailing, reading, writing, star-gazing, pondering, and bathing. But today the monotony was broken as after 800nm on the one tack, we finally gybed and winged-out the sails to run downwind and head north-east to catch this elusive low pressure system. The benefit of sailing winged out (foresail poled out on one side; main on the other) so we can sail with the wind almost behind us allowing us to continue our course directly. In this case the alternatives with a sou’wester would be to sail north or east. The downside is the yawing from side to side, which makes eating a bowl of nachos quite challenging! Not to mention the difficulty in sleeping when the boat slews down the waves then corrects itself (yawn). As I write this at 2.30am on a very dark night, there is up to 25kn from the south west, no moon, some lightning, and clouds blanking out any starlight. It’ll be morning twilight soon…my favourite part of each day. Date/time(UTC)/position: Sunday 28th May 2017 / 0630UTC / 31deg06min N 057deg58min W.